The most important feature of a laptop or high tech cellphone is the processor now a days, hence the iPhone 4S will be powered by a new A5 processor. The A5 is a dual-core processor which is believed to be twice as fast as the A4 (the processor in iPhone 4) the graphics processing is said to be seven times faster as well. Apple is also claiming faster data speeds (with maximums of 14.4 Mbps download speeds, and 5.8 Mbps upload). The battery life is slightly longer 8 hours talk time, previously 7 hours in iPhone 4, however the standby time is lesser (200 hours in iPhone 4s versus 300 for iPhone 4). Apple have added three more megapixels to the iPhone’s camera, but that’s just about the least interesting, and certainly the least important part of the 4S camera upgrade. So what is more interesting in iPhone 4s Camera? The big news is threefold. Lens, sensor tech and processing hardware. Lets have a look in more detail. The iPhone 4s lens now has a maximum aperture of f2.4, which not only lets in more light but also allows for a greater separation between subject and background. This shallower field of focus won’t rival an SLR because depth of field is also a function of sensor size. The lens also gets another element, bringing the total up to five. It might seem like putting in more glass would make it harder for the light to get through, but more elements usually equates to sharper and a lesser distorted images. While more pixels means you can print bigger images (handy for Apple’s new Cards app), it also means bigger file sizes and often more noisy images as electrons bleed between the tiny, cramped photo sites. Afterall with pixels, its quality, not quantity. But the 4S is using a new kind of chip, which has back-side illumination. So what does that mean? This confusing name just means that all the electronics on the chip are on the back. Normally, front side, or top side illuminated chips have all the junk on top, where it impedes the light. Thus equipped, Apple claims increased light sensitivity of 73 percent. How about that? Another surprisingly technical term mentioned on the product page is “full well capacity”. This is what it sounds like. Each pixel can only accept a certain amount of light before it fills up. When this happens, the light spills over into adjoining pixels. This is called “blooming,” and is a bad thing. A higher capacity means a higher dynamic range. One note: Most of the sample photos on Apple’s site are shot at ISO 64, making even the low-light images pretty noise-free. 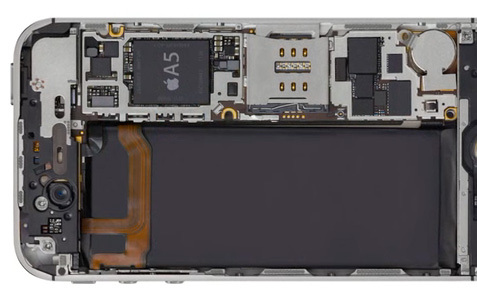 The Faster A5 system-on-a-chip in the iPhone 4S turns out to contain dedicated image-processing hardware. This is similar to the “high tech processing engines” found in regular cameras, such as Nikon’s EXPEED and Canon’s DIGIC. This hardware makes the camera a lot faster. While we’ll have to wait to test it in real life, in the demos, it shows that the camera performs at the speeds of a compact, not a phone. It snaps photos faster and gets them on-screen and ready to see a lot quicker. It also lets the camera do some other fancy tricks. Upto 10 Face recognitions are now possible and I wouldn’t be surprised to see this tie in with iPhoto’s Faces feature to auto-tag people right there on the phone. It also adds image stabilization — probably electronic, not sensor or lens-shifting — to video. And the video shot is now 1080p. That’s great news, especially as you should be able to edit them on the iPad’s bigger screen. While not essential, it’s nice to be able to crop and edit photos right there in the app. You can also rearrange your pictures into albums in the photos app. These are iOS5 features, coming to all devices, and really make the iPhone and iPad independent from a PC or Mac. Of course, this also makes it easier to lose your photos, but that’s what Photo Stream is for. Though Apple didn’t mention the reasons for the current limitations of Siri, they’re likely due to the upgraded internals of the 4S over earlier iPhones, particularly the RAM available for the A5 chip. Siri’s voice processing happens in the phone, unlike Google’s equivalent services, which send samples of sound off to the cloud for processing…something that takes time, requires a good 3G connection and which will hit users on limited data tariffs. It’s hard to overstate exactly how transformational Siri is to the smart-phone experience, and it’s possible it may become one of the biggest draws to the new iPhone 4S. Can’t wait to get my hands on this phone, can you?